Day 43 – A day of hospital visits again. Dad’s confusion has pretty much lifted so they are likely to send him home soon. Got home from hospital and Rosie had squeezed herself onto a box – she does make me smile! Day 44 – Popped to Toys R Us as it was one of Bee’s friends birthday over the weekend and she wanted to get a present! Walked past this storm trooper and got a fright when it talked. Dad also got sent home from hospital in the evening. Has to limit the salt in his diet and make sure he drinks enough or the confusion will come back. Day 45 – Took mum shopping to Morrisons and spotted this dress and denim jacket for Bee. Couldn’t resist getting them! 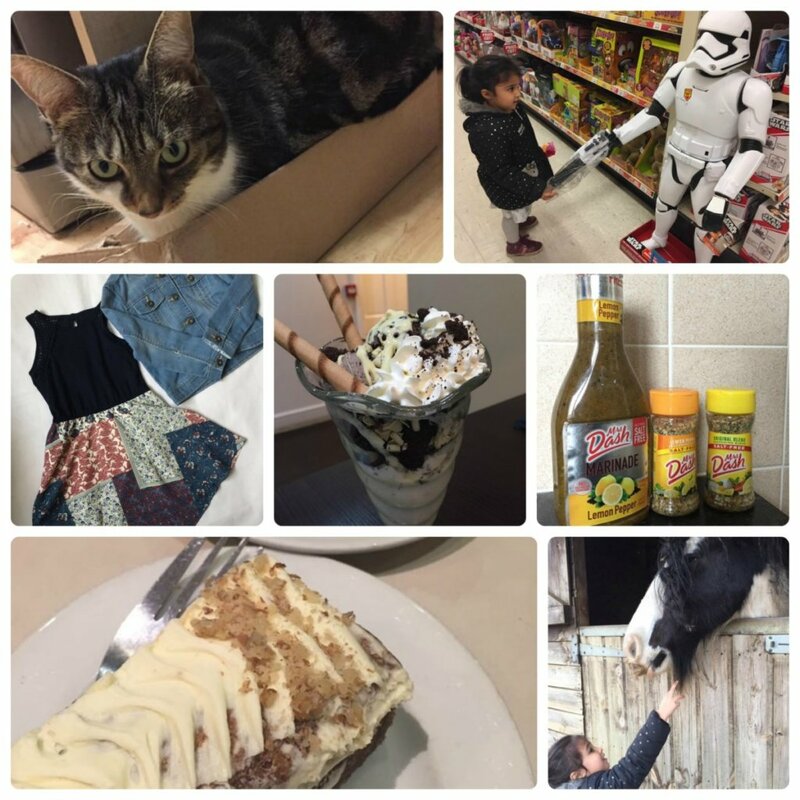 Day 46 – Hubby’s birthday today. He came home from work early so we popped out for some dessert. Day 47 – Someone in our Muslimah Bloggers group recommended Mrs Dash seasoning as it is salt free. Ordered it off eBay and will see what dad thinks of them. Come the evening I felt very unwell…suddenly got a really bad headache, whole body was aching and I couldn’t get warm even though the heating was on, had a thick cardigan on and was in bed. Hubby took Bee to karate, gave the girls their dinner and put them to bed. Day 48 – Feeling rubbish with a sore throat and headache but nothing as bad as yesterday. I always seem to get sick just when half term is about to start! But still had to take the eldest to her maths tuition so while Bee and I waited for her, we had a hot chocolate and some cake. Day 49 – Still feeling pretty rough. Hubby dropped off the eldest at horse riding before he went to work and then I had to collect her. Bee of course had to go round and say hello to all the horses. Pictured is Jim, who tried to eat her coat! Hope you feel better soon. We got through half term well, but now have colds as we’re going back to work and school! chickenruby recently posted…Sharing my son with another family. Do you just go out for pudding or do you have a main course as well? Glad you dad is home again, and hope if he keeps his salt down and his water intake up that is helps. Always have dessert, i would love a caramel tart with custard now.